Episode 48 - The Pandavas have come out of hiding and are demanding their lands back from the Kauravas. Duryodhana has already indicated that he has no interest in giving these back, so it would be best to negotiate from a position of strength. An arms race ensues, with both sides scrambling to get commitments from their allies across India and beyond. Duryodhana wins the first couple of rounds at this game. 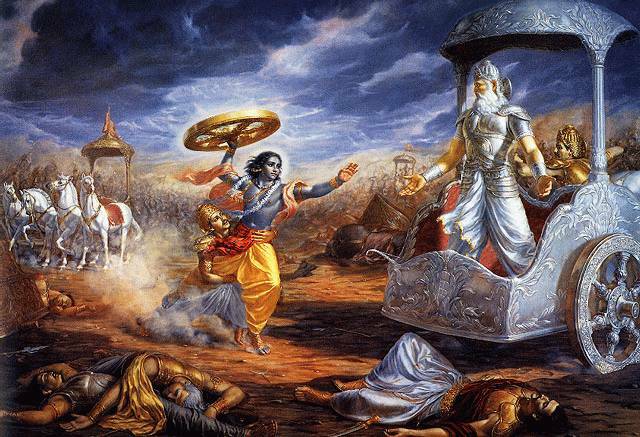 He rushes to Dwaraka, and gets Krishna to commit his armies to the Kaurava side. The Pandavas get Krishna; as an unarmed advisor. Duryodhana also plays on the generosity of the Pandavas' ally King Shalya, by providing hospitality to Shalya's army while it was on the march. When Shalya offers a boon to his host, Duryodhana presents himself, and asks for Shalya's support in the war. The king has no choice but to grant the request. The king journeys on to meet with the Pandavas and tells them what had happened. Since Duryodhana fooled them fair & square, Yuddistira accepts the fait accompli. He only asks that Shalya do whatever he can to throw Karna off his game when the big chariot duel between Arjun & Karna takes place. Shalya also takes the sting off a bit by telling the story of Indra's Victory. This is a strange story in which the brahmins completely dominate the course of events. A brahmin picks a fight with Indra, and although Indra acts in self-defense, he is nevertheless guilty of brahmin-murder, and he suffers accordingly. The force of the punishment makes Indra sort of resign his post and go into hiding. The Man-God Nahusha is then nominated king of heaven (by brahmins & gods), and the brahmins give him his very own superpower. When Nahusha turns out to be a power-hungry lecher, the brahmin priest Brhaspati advises the gods on how to get their old Indra back. Indra is powerless at this point, so he suggests to his wife that the best way to take down Nahusha would be to get him into a fight with the brahmins. Nahusha walks right into the trap, makes himself a brahmin-drawn chariot, and ends up offending the entire race of priests. It's all over when he specifically annoys Agastya, and gets cursed to life as a snake for 10,000 years. It seems that in this story the "kshatriya" gods are just pawns in a brahmin game! Finally, the Pandavas and Kauravas have gathered their allies-- 7 grand armies for the good guys, and 11 armies for the bad guys. Now the negotiations can commence! Trisirsa is the lamest name ever. It means three heads. I like the names like satyaki which tell us something about the person. ( satya means truth... so his advice is good to listen to). Lawrence... I enjoy your podcast very much. After catching up on 46 podcasts ..now I eagerly wait for new update every week. It seems that podcast membership is not that good as it could be. When compared with other podcasts this would rank among the best podcasts. There are not many dedicated podcast on Hindu Mythology. When I tried subscribing few weeks back via iTunes I noticed that this podcast has been classed as 'EXPLICIT'. This could be putting some people off. On bright side in Google search this podcast is top result for Mahabharata podcast. Thank you both. I love comments, especially informative ones like these! Thanks Anonymous for the translations. If you could tell us the meaning of the other characters' names, that would be great. I suspect Satyaki was invented specifically to tell the truth to Balaram, so the name came naturally, eh? I emailed some university departments to plug the podcast, but at best that would only gain me a few hundred more listeners. I guess people just need to be more aware of podcasting and the Mahabharata for me to get any larger audience! Rating lower than explicit should help. Personally if I see explicit i would expect swearing etc but I am no authority on ratings. Also I feel that your style and comments are not raunchy enough to deserve an explicit rating especially when compared with other podcasts and stuff on net. Ah well, I looked into removing the Explicit rating, and first of all, iTunes says that if I take it down and they find out I had "grown up" material, they will cut me off! So that's kind of scary. To make matters worse, it seems like I could only enter the tag information in Feedburner when I set up the stream for the first time! So it looks like I'd have to take it down and set it up again, which I also find scary-- what if I lose all my listeners in the process?!? It's getting complicated, but I'll keep looking into it! I also dropped a line with the puja.net folks. I love Ben Collin's podcasts, he has such a great voice for it. I'm jealous. I only started listening to these podcasts about a month ago and have got to this episode. I'm sorry its taken me this long to get to your blog, as I'd like to express my great thanks for this wonderful endeavour. I've been raving about it to my friends and family.